A team at the University of Veterinary Medicine, Vienna, has discovered that nearly all today’s horses* trace tail-male back to Arabian and Turkoman stallions brought to Europe over the last seven centuries (yes, pre-thoroughbred). There is so little diversity in domestic horses’ Y chromosomes that it took an advance in research methods to be able to distinguish between the limited lines out there. Researchers will even be able to designate haplotypes for single stallions, which is how they discovered the Turkoman great great great great great great (times a few more) grandsires of today’s thoroughbreds. Here’s a link to their research. The fact that in modern times we humans chose to use a small number of stallions to improve our horses makes an interesting contrast to a study published in April on the early years of horse domestication (from 3,500BC on). When I was working on The Age of the Horse, I believed the current research, which suggested that very few stallions were involved in the process of turning wild horses into stockier, faster, more colourful and higher milk-yielding domestic horses. The study team revealed that the opposite was true. In fact, we began our working relationship with horses with plenty of stallions and lots of Y chromosome and haplotype diversity. You can see the study here. Then the bottleneck narrowed as we discovered intensive breeding and those fancy Oriental stallions. *I would be curious to know which modern breeds were used in this study. Would the results be different for Mongolian horses? Hon Mrs Alfred Lyttleton DBE at a Women’s Land Army Rally, January 1918 edition of The Landswoman Magazine. This blog post is a sequel to Women, Horses and World War One, which I wrote in 2012 after Fran Jurga, who was running the official War Horse blog, tipped me off. The centenary of the Great War has renewed interest in women’s role both on the front and at home, and lots of people were curious to learn about the uppercrust and middle class young women who turned out to work for the organisations that became the Women’s Land Army. The first blog post concentrated on the women who worked in remount depots for the army, rehabbing or training horses that would go back to the front. This post was inspired by the chance I had to take part in a BBCWest/BBC 4 documentary on horses in Britain during the war, and brings together some of the sources I discovered when doing my research. If you have no idea what I’m talking about, start here, with the original essay! Two things need to be borne in mind when we talk about how great it was that women were freed up to do men’s work and get all empowered in quite a glamorous fashion, etc., etc. Firstly, though there were several remount depots run solely or partly by women, most of the Women’s Land Army worked in agriculture, forestry or forage production. If they got near a horse, it was probably a big carter, not an officer’s charger. They are the women writing cheerily about chilblains or the joys of pig keeping in the Landswoman Magazine, struggling against the prejudice of the cash-strapped farmers, who were both sceptical about their ability to do the work and worried about the relatively high wages they were awarded. To get a little flavour of the times (and their propaganda), I recommend spending hours at the excellent Women’s Land Army website, where you’ll find a collection of scans of this hearty publication, complete with advertisements for Royal Vinolia face cream (“Beauty on duty has a duty to beauty”). The second aspect you need to bear in mind is that only some 20,000 or so women were recruited into the organisations that became the Women’s Land Army, a total which is not insignificant, but is dwarfed by the 180,000-odd “village women” who were also working in the fields, farmyards and forests. In other words, rural working women for whom the labour was not a patriotic novelty, but a familiar part of the day-to-day grind. Class! I found Kate Adie’s Fighting on the Home Front a really excellent overview of all the women, from duchesses downwards, who were involved in the World War One workplace. She doesn’t mention the remount depots, but does dedicate a chapter to the women who made all the haynets required by the British Army – not glam, but utterly essential. But anyway – we’re here for Russley, which was in many ways the most prestigious of the Women’s Land Army postings. Not only did the twenty or so young women work with horses, but officers’ chargers. Not only was the stable run by women, but the superintendent was the wife of the Director of Army Remounts, Lord Birkbeck. No wonder they were photographed, filmed and even painted (see the first part for a little about Lucy Kemp Welch’s beautiful pictures). 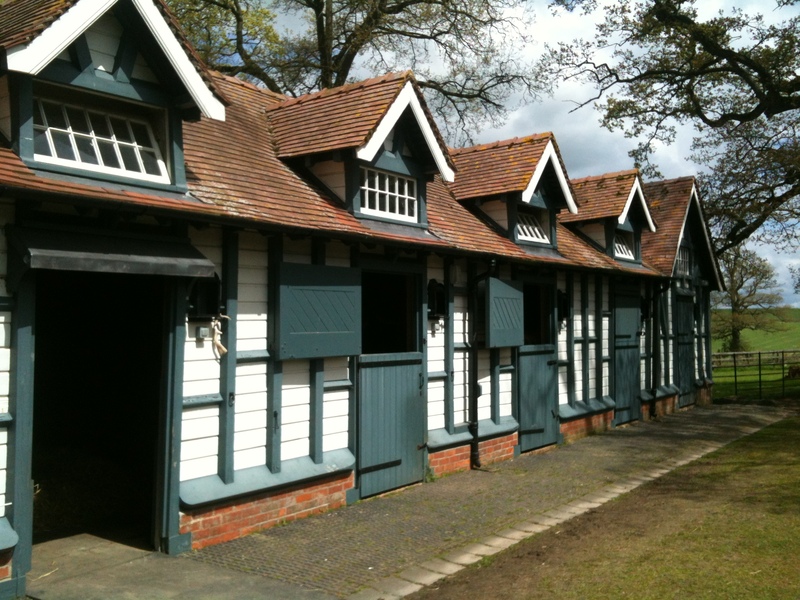 This row of stables at Russley Park dates from the late nineteenth century and has been beautifully restored by the current owners. From the paintwork to the brick floors, porcelain feed troughs and drain traps, it’s a labour of love and a gem of its original era. 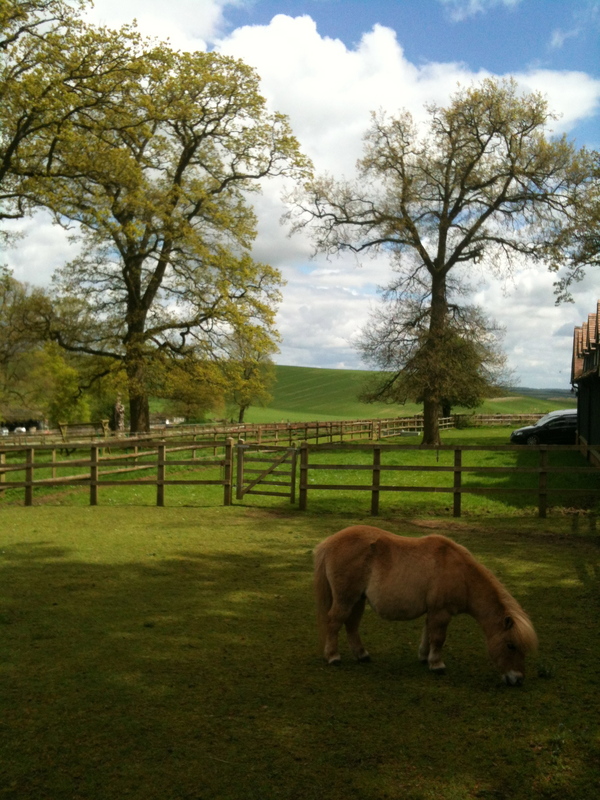 The only current resident is a chestnut shetland pony called George (see below). They were built by Russley Park’s owner in the late nineteenth century to house his racehorses (the park was originally a hunting estate dating from 1700). The estate is a hop, skip and a jump from Lambourn – still a hub for trainers of both flat and national hunt horses. In 1907 it was purchased by Colonel William Hall Walker, the eccentric third son of a brewery magnate, who bred and trained horses both at Russley and in County Kildare in Ireland. Obsessed with horoscopes, Walker had charts drawn up for all of the foals he bred, and chose lantern-roofs for the stallion block in Tully, Ireland, so that the studs could be influenced by the sun and stars. In 1915 he sold both stables to the Secretary of State for War and handed over two stallions, 30 broodmares, 10 yearling fillies and 8 horses in training. The idea was that the government would be able to breed half or three-quarter thoroughbred horses for the cavalry. Of course, by this stage it was rapidly becoming clear that there would not be much call for cavalry horses in the British Army’s future. If you click through to this extract from Hansard, you can see the March 1916 parliamentary discussion over what on earth the nation was supposed to do with Russley Park and Tully. One side is arguing that the racehorses will be loaned to Lords Lonsdale, and that the top-class stallions will contribute to a better class of cavalry horse. The other side is pointing out that what’s really needed is light draught horses to haul artillery and provisions. In the end, Russley Park was used to care for officers’ chargers and new horses from Ireland and elsewhere. There were a couple of broodmares there, but the plan to turn it into a military stud didn’t materialise. Walker was made Baron Wavertree, and Tully became the Irish National Stud. Screengrab from the Library of Congress’ Chronicling America archive. “Women grooms. How we look after the horses. … I am very sorry for the girl who tries to deceive our ‘boss’ about her knowledge of horses. It is disconcerting enough in any case, as you slip by a pair of possibly tactless heels to where you get some horse may own a head and headstall, and then to lead him to the trough, where other dim figures are holding other animals, tramping, snorting, biting, kicking. You are not nervous (absurd idea!) But the effect is weird, grotesque in the darkness, and, as I said before, I am sorry for the girl who comes as a pretender. It would be a pleasure to go on writing about her, but perhaps you have said all when you have said that she can do anything with any horse and that there is not a girl in the place who does not enjoy obeying her. She is a born commander. And it is so rare an instinct in woman that I doubt if there be one in a thousand who could command such absolute, unwavering confidence. And it is her personality backed up by her knowledge that has made our depot the successful concern it is. The more you know of horses, and especially of the raw, rough brutes, many of them thoroughly vicious, which are bound to be among any lot picked out at random from the army type of animal, the more wonderful it seems that we should run them without a man on the premises. Wonderful. Why, it comes near to being incredible! And without her it would be incredible. Some of our girls are fine, fearless horsewomen, and before they have been here long we’re all fairly competent grooms; but it is she who tackles the dangerous horse first, she who is always on the spot in every emergency, and she, too, who organises everything from ordering the tons of hay, oats, bedding etc, to noticing that are stray cats get a saucer of milk in the harness room at teatime. Nothing escapes her vigilant eye nor ever seems to perturb the humour in her face. With a savage horse she is a marvel, and so calm about it into the bargain. She tamed one who came to us with the cheerful reputation of having half-killed six men running till nobody dared go into his box. Only the other day I was absolutely defeated by a black fellow we called the Snorter or the Warhorse. He bit, he kicked , he struck at me with his forelegs. … He seemed as supple as indiarubber, and his wicked hoofs came crashing around within an inch of me time after time, till at last I went limping off on one foot and a half to say I couldn’t get near him. Well, she came and talked to him and showed him (only showed him) a little short thick stick, and he stood like a lamb after the first five seconds. For the Remount Depot is not a picnic. Now that we have roused the curiosity of a larger public than the small boys who came tumbling out of the cottages and the grinning motorists in passing cars, to whom our string of horses ridden at exercise by ladies on cross saddles was an object of amusement, we’re always seeing ourselves in illustrated papers labelled ‘Smiling Dianas,’ or something equally foolish. We are doing men’s work, as much of it as men could do and considerably more than men would have done in those dim, distant days before the war had taught most of us to put our backs into a job of work and keep them there. It seems a long, long while since one strolled out after breakfast in well-cut habit and shiny boots to where our well-mannered hunter awaited us in the yard with a stud groom and a helper or so in attendance. But everytime our back aches under a truss of hay or a sack of oats we are braced up by the thought that we (and we hail from New Zealand, Ireland, the North country, as well as England proper) are taking our share in the work that they are doing across the sea – there where our hearts are. And in that thought we go on cheerfully as before. For we are a very merry crew, mostly under twenty-five I should imagine, and we get to love the horses as if they were our own. There is beautiful Venus, the chestnut mare, for whom I always steal a few minutes from my other charges to make her coat glow in the sunlight. And old Pasha, who looks like a cross between a camel and a clotheshorse, and he knows at least seventeen methods of either nipping or kicking you, even he has his genial moments – at the drinking trough, for instance. And Satan, who never goes out except with our rough rider; it takes several of us to hold him like a rising balloon till she jumps into the saddle, and then away they go in the maddest series of rushes across the paddock. And Baby, how our young carthorse, who weighs 15cwt or so and comes bounding down the riding school to her morning drink in charge of a wee wisp of a girl you could almost pick up in your hand. 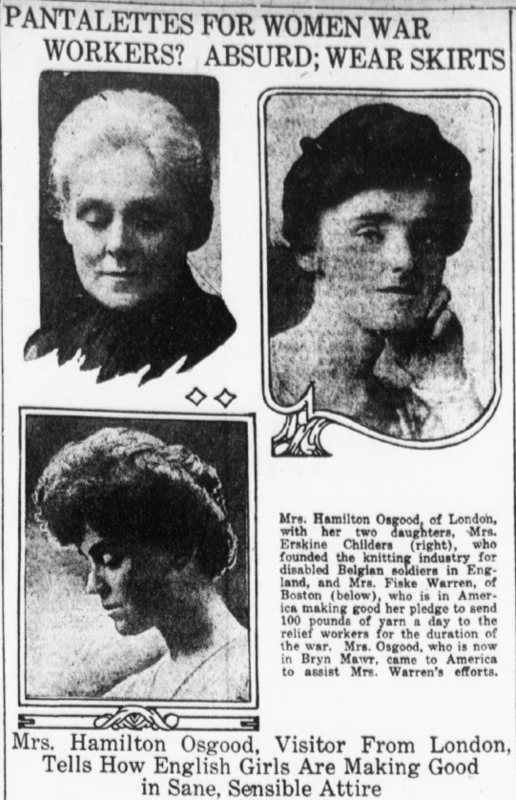 Lastly, here from the April 1919 edition of Landswoman Magazine is a list of women from Wiltshire who were awarded Good Service Ribbons for their efforts in 1914–1918. Could some of them have worked at Russley Park? Over to you. Part one of this post. A domestic horse with a decidedly Przewalski look. 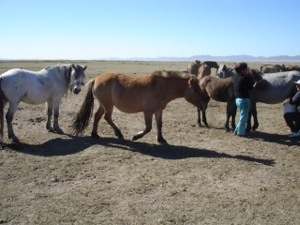 Near Hustai, Mongolia. Photo by author. Two pieces that turned up in internet searches within minutes of one another. Firstly, a rather gruelling article about the complications involved in trying to breed Przewalskis and return them to a degree of wildness in China. And secondly, as light relief, an entire site full of chocolate moulds, which includes one for a… Przewalski. The photo is of a Przewalski-esque domestic horse belonging to a herder just outside Hustai National Park, Mongolia.